Join Us for the Opening Reception, June 21, 6:30 to 8:30! “This exhibit takes its title from a less-than-profound observation. We cannot see through, beyond or beneath the surface of things. Hence, in the visible world, home to the visual arts, everything is superficial. The great Sir Laurence Olivier’s was once asked, ”why did you choose acting as a career?” He replied, “look at me, look at me, look at me, look at me, look at me.” Like Olivier, I am motivated to show off what I can do, how I can pull-off the remarkable feat of using paint on a two dimensional surface to create an illusion of a 3D subject. This is particularly satisfying if the subject is challenging or tricky – like a moving, reflective, faceted, translucent or textured surface. So, initially, my intention was a simple stretching exercise, nothing more. I set myself a goal to complete, everyday, a new painting of some particularly challenging subject. Some days the muse was with me. As the walls surrounding you attest, on others she was not. Nonetheless, over the course of four months in early 2017, I managed to complete 111 individual ‘studies.’ As the work progressed, however, a more ambitious objective took shape in my thoughts – to meld all these desultory images into a single coherent installation, a sort-of mosaic tableau or panorama. 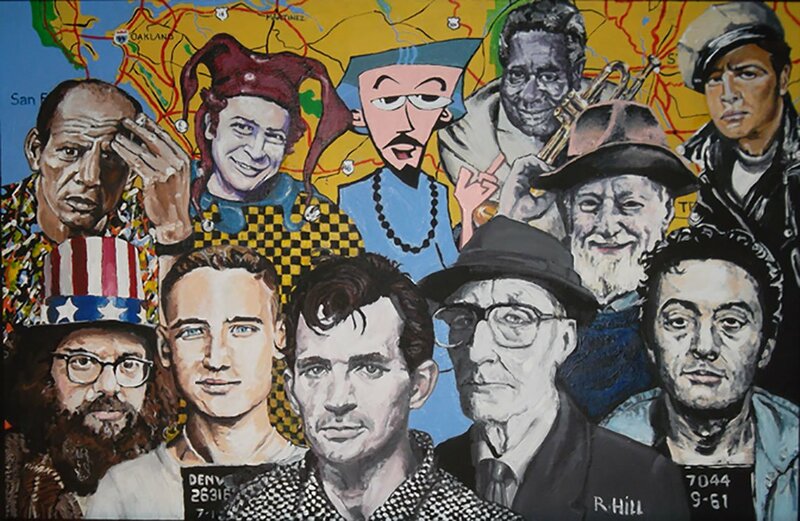 Hill describes his “Collective Iconographies” as assembling and juxtaposing multiple iconic portraits and grouping them together thematically. Images are drawn from a wide array of familiar media – magazine covers, coins, sculpture, photographs, comic books and the like. Each painting seeks to faithfully imitate the style, medium and vocabulary of the original images to ensure that they are readily recognizable. 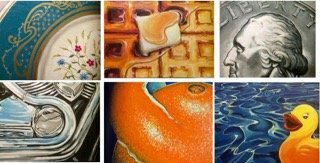 Visit our gallery and enjoy the humorous, thoughtful, and sometimes quirky juxtapositions in each piece. All of Richard’s work can be viewed on his website. Go visit! 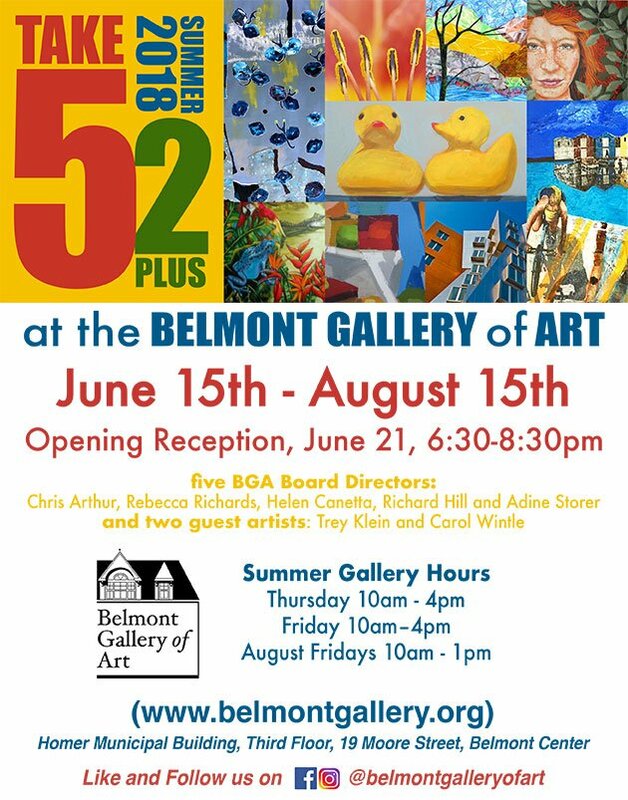 02478 is the summer exhibition of the Belmont Art Association (BAA), and offers an opportunity to meet many of the artists—both amateur and professional—who live and work in our community. Showcasing work by BAA members, the exhibit includes work in a wide variety of media from painting, drawing, printmaking and collage, to sculpture, ceramics, textiles, and photography. 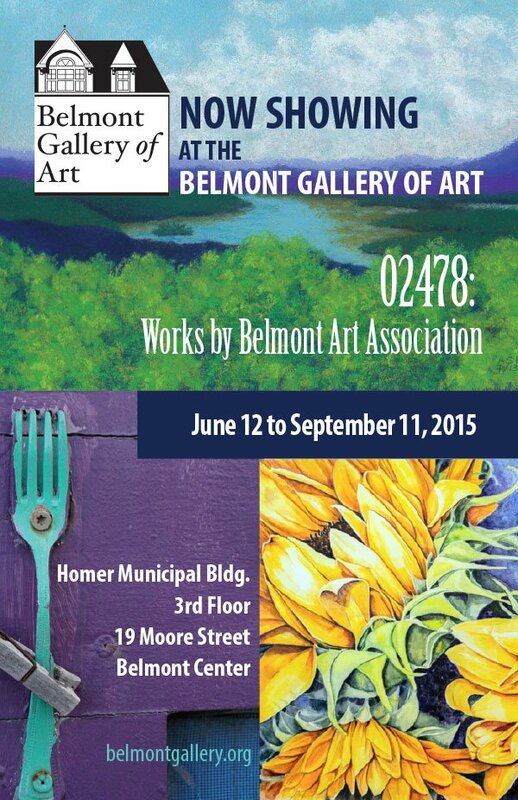 Founded in 2013, the Belmont Art Association’s mission is to “create a community of and for Belmont-based visual artists by sharing information and resources and creating opportunities to display their work.” For more information about the organization visit their website. Thanks to all who attended the Opening Reception!